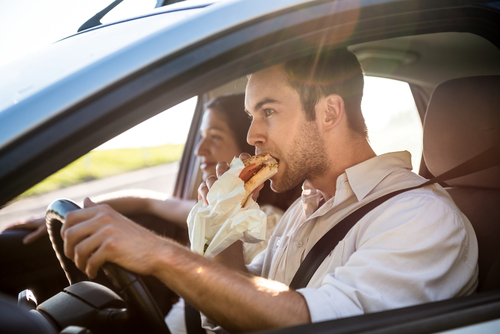 According to the National Highway Traffic Safety Administration, eating while driving makes you 80 percent more likely to be involved in an accident. Additionally, 65 percent of all near-miss accidents are caused by drivers who are eating. While it is technically not illegal, it poses a danger for many reasons. Therefore, if you have been injured due to a driver who was eating, contact an auto accident attorney in Orlando to discuss your legal options. When a driver is distracted from eating behind the wheel, they will become very complacent, especially if their food tastes good. In these cases, they focus more on the food than on the road and what is around them. As a result, their attention span becomes limited, resulting in an inability to react quickly to other drivers or pedestrians. If you have been involved in these situations and injured as a result, speak with a personal injury attorney in Orlando who has experience handling such cases. While a burger and fries may taste good, eating them while behind the wheel is a recipe for disaster. Not only will drivers be distracted due to the good taste, but they will also have messy or greasy hands as well. When this happens, it becomes far too easy to have their hands slipping off the steering wheel, resulting in them being unable to make a quick turn or have a good grip on the wheel. Unfortunately, this will probably mean someone be injured as a result of their poor judgement, which is why you will need an Orlando accident attorney on your side if you have been hit. By hiring an Orlando auto accident attorney if you or a loved one have been injured due to a driver who was eating while driving, you can gain the financial compensation needed to cover medical expenses, lost wages, and pain and suffering.